What might be the oldest surviving work of art in the world—a painting on the Indonesian island of Sulawesi—features a babirusa, a peculiar species of wild pig that have fierce-looking tusks. Archaeologists estimate this work is at least 35,400 years old, shattering the notion that humans began making art in Europe. During the 18th and 19th centuries, a series of unusually clever pigs—called “sapient pigs”—toured Europe and America performing tricks such as telling the time and spelling names. One of these clever animals was immortalized etching by English artist Thomas Rowlandson, who depicted a pig spelling out words to the amazement of a crowd. Will Co-Working Spaces Of The Future Look Like Hotels? Australian artist Patricia Piccinini has shocked audiences around the world with her hyper-realist—and often grotesque—sculptures of part-human, part-animal creatures. Many of these works explore ideas about biotechnology, gene therapy and how technology may be used—or misused—to alter the human body. Although many of Piccinini's sculptures are made specifically not to appear like any particular creature, some of her works are distinctly pig-like. One of these is The Bond (2016), a sculpture that features a human woman cradling a pig-like baby. Provocative Belgian artist Wim Delvoye sparked a media storm when he began that tattooing live pigs for his artwork in the late 1990s. 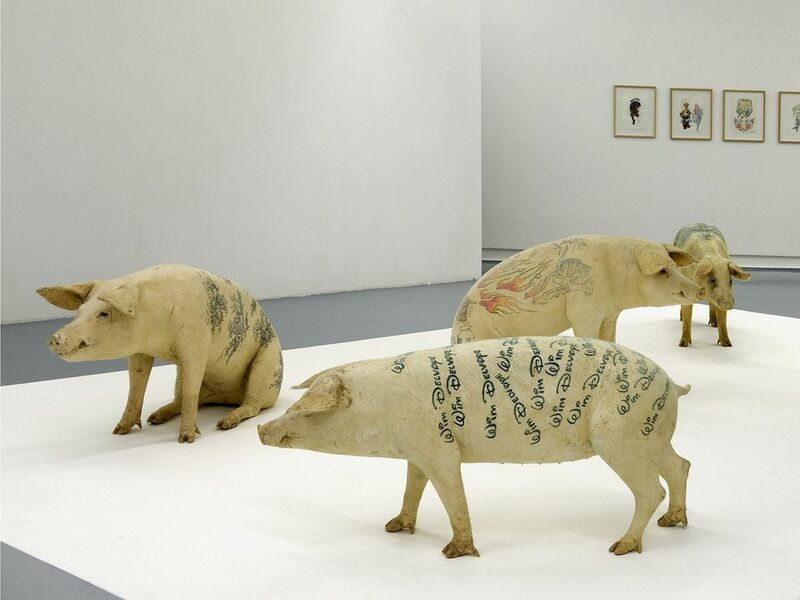 After he’d finished tattooing the pigs, they were exhibited live in galleries and, upon their death, were stuffed and sold for prices reportedly as high as US$100,000. British artist Damien Hirst may be most famous for preserving a shark in a tub of formaldehyde, but he’s made similar installations out of other animals—pigs among them. This installation, Pigs Might Fly, sold for nearly US$900,000 at Damien Hirst’s record-breaking auction Beautiful Inside My Head Forever. The auction was wildly successful, even though it occurred over the two days in September 2008 when the financial crisis began and Lehman Brothers went bankrupt.